SM East edged Olathe North, 37-27, in the 6A East Sub-State game a season ago. Photo Marisa Walton, SME Harbinger. Last meeting: SM East beat Olathe North, 37-27, in Sub-State last year. Venus Triplett, Olathe North: Statistically speaking, nothing Triplett's done this year will go down in the Olathe North record books. But his ability to make a big play, at the biggest moments, it what makes him an elite back. Look no further than his 83-yard touchdown reception out of the backfield last week as the key play which sprung the Eagles to a lead and the victory. 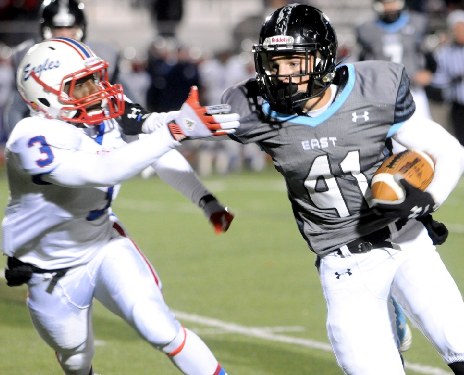 Kyle Ball, SM East: The FBS-bound Ball has been a stud all season, but especially in the playoffs. Through two games he's recorded 27 tackles (eight for loss) and a sack. What's more, the Lancers have surrendered just one touchdown, and it came on Lawrence's opening drive of the Regional game. Ball is a relentless, physical freak, and he has the potential to make as big of an impact on the game as anyone. A win would put the Eagles in a state title game for the 10th time in the last 19 years, which is really an insane statistic, if you think about it. It's even close to Lawrence's historic hay day, where the Chesty Lions made 13 state title games in 18 years. Lawrence holds the all-time record for Kansas state titles with 10. A state title victory would put Olathe North at nine. If SM East wins they would be the first team from 6A East to make back-to-back state title games since Olathe North did it in 2009 and 2010. A win would also give the Lancers 12 wins on the season, which would be the most ever in a single season for the program. Last, but not least, it would give head coach Dustin Delaney 23 career wins with SM East, which would be the most ever by a Sunflower League coach through their first two seasons. Well, it's pretty obvious what we'll see in this one. The league's best offense (SM East) versus its best defense (Olathe North). We've been waiting for this game since August, and it's played out like a fairytale: co-league champions, both undefeated, in a rematch of the 6A East Sub-State game from a year ago, with the winner advancing to the state title game. Some are even calling this matchup the de facto 6A state title game, although the Firebirds or Salthawks will have something to say about that. But I'm not going to analyze this one any more. We've been analyzing it for 11 weeks. It's time to see who wants it the most on the field. Bryce Torneden, Free State: The Firebirds have an outstanding lineage of dual-threat quarterbacks. In fact, Torneden is the fourth different starting quarterback to lead Free State to a Sub-State game since 2006. But he can sort of separate himself from the rest if he can lead his team to a state title as a junior. His stats speak for themselves: 1,237 rushing yards and 15 rushing touchdowns, plus 958 passing yards and 10 rushing touchdowns. He's also a pretty solid free safety when he's not taking snaps under center. Blaik Middleton, Hutchinson: Middleton's 2,268 rushing yards this fall set the Hutchinson record for most rushing yards in a single season. And he accomplished the feat in just 11 games. That should tell you something, especially considering the Salthawks have had guys like Kerry Gamble, Romero Cotton, Josh Smith and Ben Heeney in their backfields. Also of note: Middleton has punched in 30 touchdowns. He will be the best running back the Firebirds have faced all year. A win would put Free State in the state title game for the second time in seven years, and bring longtime head coach Bob Lisher one step closer to the elusive state title ring. It would also mark Free State's sixth win in a row, which would be quite remarkable considering they began the year 2-3. The Salthawks are aiming for their 10th state title trip in the last 12 seasons (they've gone 7-2 in state title games in that time frame). Perhaps more importantly, it would instill confidence in the Hutchinson community that first-year head coach Ryan Cornelson is capable of carrying on Randy Dreiling's legacy of winning football, if the Sub-State run hasn't already done that. If Hutchinson still makes a state title game without Dreiling, then we all lose. Okay, that's just me playing to the Sunflower League's collective pathos, but there is some truth in the statement. An All-Sunflower League state title game would be epic for those who follow the Sunflower League, regardless of which league team you root for. I think Free State's going to have the fight of their lives slowing Middleton, but I've seen the Firebirds step up to every task they've faced since districts, and there's no reason to believe it will stop now. Fourth sub-state game in nine years, yet only one win. Great opportunity to make it two. FS has come a long way in the last month in a half - really finding what works and playing all three phases of the game. Another like effort tonight gets the big reward. Can't wait! Go 'Birds!